The No. 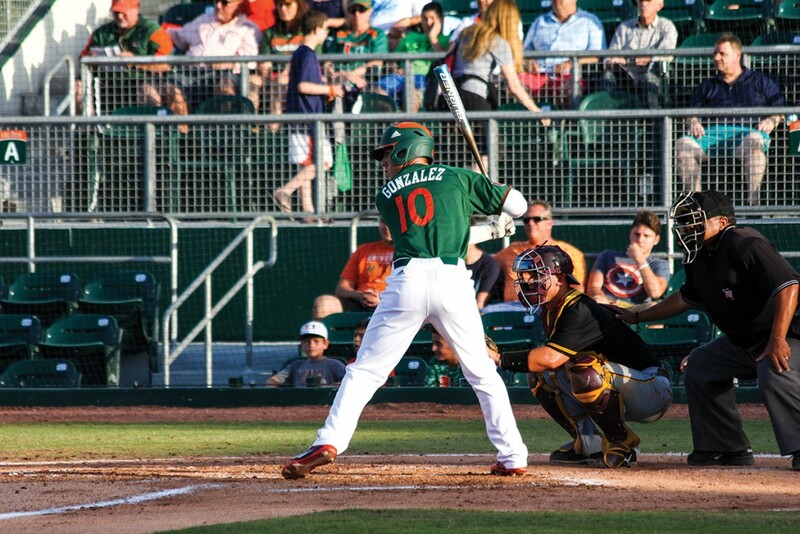 4 Hurricanes weren’t at their best on Wednesday night, but they did just enough to get by Bethune-Cookman 5-4 in front of 2,430 fans at Mark Light Field. The Canes looked primed for another blowout over the Wildcats after one inning. Miami knocked in three runs in the first, the same amount Bethune-Cookman scored in two games combined against UM last season. The Canes scored 27 runs in those two matchups. Bethune-Cookman (9-13) scored runs in the second and the third innings while Miami (17-4) failed to get a base runner. The Wildcats ran right-handed sophomore Jesse Lepore out of the game after 83 pitches in just four innings. Lepore allowed two earned runs while walking three and giving up three hits. Right-handed freshman Keven Pimentel came in for Lepore and pitched a scoreless fifth before giving up one run in both the sixth and seventh innings. The Wildcats tied it up in the sixth on an RBI single by Demetrius Sims, but Miami went back up 5-3 on a two-out rally in the bottom of the inning. The Canes got two runners in scoring position after junior outfielder Willie Abreu was hit by a pitch and junior designated hitter Edgar Michelangeli singled to center and stole second. Freshman third baseman Romy Gonzalez knocked in both runs with a single up the middle. Gonzalez was starting for the first time since March 9 and had two RBI on the season coming into the game. Despite not starting in two weeks, Gonzalez didn’t have a problem staying ready to play. “I was just working hard the days I didn’t play. Stayed believing in myself and just waited for an opportunity to contribute,” he said. The Wildcats cut the lead back to one in the seventh on a solo shot over the right field fence by Michael Cruz. Pimentel (2-0) pitched the rest of the inning and passed a one-run lead to right-handed reliever Frankie Bartow. The freshman induced three groundouts for an easy top of the eighth. Junior closer Bryan Garcia pitched a scoreless ninth for his ACC-leading eighth save of the season. Garcia now has 33 saves in his career, one away from tying Robbie Morrison for third place and six from first in UM history, but the star closer says the record isn’t on his mind. Miami has now won 12 of its last 14 games and is 14-3 at home this season. The Canes next play Clemson in the first of a three-game series at 7 p.m. on Friday at Mark Light Field.